When you come across a video you like on YouTube, you may want to share it with friends by email. In this tutorial, we will show you how to send a YouTube video by email with Yahoo Mail, and using YouTube's built-in email and messaging functionality. 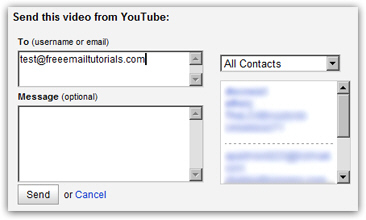 There are two ways you can email a YouTube video: either from YouTube itself, by using their Share > Send command (which we'll show you as well in this tutorial), and by sending the link to the video; we'll start by explaining why embedding a video in your email is technically possible, but cannot be done for security reasons. Can you embed a YouTube video in an email? So, the next best alternative to actually embedding the video in an email is to send an actual link to the video, that the recipient can click to open YouTube in a new browser window. One option is to email a link to the video from YouTube itself: the downside to this approach is that the email will come from a YouTube email address, not your Yahoo Mail account. In some cases (where an email reply is not needed), this may not matter. To email a link to a YouTube video, click on the Share link displayed right below the video player; then, click on Send Video (notice that you can also share the video through Facebook or Twitter). But the Send Video option uses email. After you clicked on the Send Video link, an email compose form will show up; you can enter either a YouTube user name (in which case the link to the video will be emailed to their YouTube messages), or an actual email address. Clicking on one of the user names or email addresses listed on the right will add them as email recipients. Optionally add a message to the email, and click Send to email the video link. This is how the emailed video link will look inside Yahoo Mail: opening the email will include the optional message you typed, a description of the video, and a clickable link and thumbnail to open the video on YouTube. The second way to email a link to a YouTube video is to use your Yahoo Mail account directly: this will allow any email replies to go directly to your Yahoo email address. This also increases the chances of not having your email filtered as spam: depending on the email recipient's settings, all emails from unknown senders (in the case above, YouTube) could be automatically filtered as junk mail (spam), or deleted. If the link to a video is sent directly from your Yahoo email address, no chances of this happening. The "URL" (internet address) of the video is always displayed right below the description: click inside the URL field to select its content, then right-click and choose Copy from the context menu. Now that the URL for the video is in your clipboard, you can go to Yahoo Mail, create a new email, and paste the URL in the body of the email. (Since the URL of YouTube videos in your browser's address bar often includes extra information, it is preferable to get the raw URL as displayed below the video description: long links can get broken across a couple of lines of text in emails, in which case they become user name-clickable - the raw YouTube URL is always short enough to avoid this problem. …And this is how you share YouTube videos by email, using your Yahoo Mail account, or YouTube's built-in email and messaging functionality.